Leicester City secured their first win under new manager Brendan Rodgers, as they beat Fulham 3-1 on Saturday afternoon. After going close on several occasions early on, Leicester took the lead after 20 minutes through Youri Tielemans. Wilfred Ndidi won the ball off Fulham's defence and played Jamie Vardy through on goal, who unselfishly squared it to Tielemans to walk it into the goal. Fulham close to earning their first point since January, Leicester retook the lead through Jamie Vardy. The Foxes striker emphatically struck it past Sergio Rico in goal, as he scored his 100th goal for the club in style. 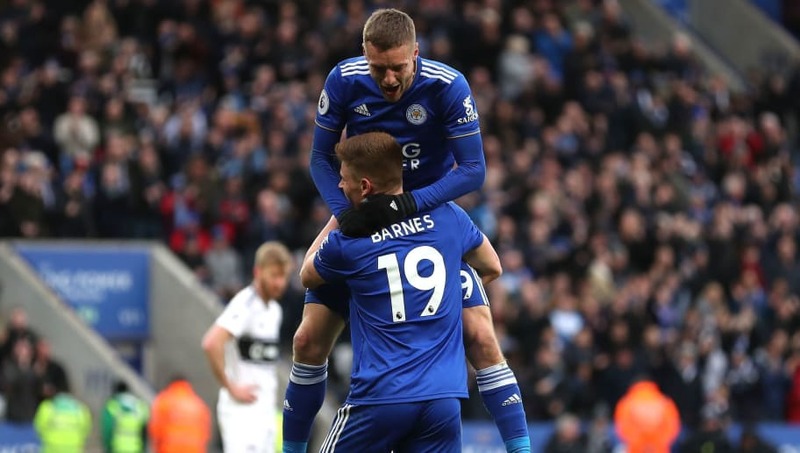 Vardy scored his second of the game just eight minutes later, as Harvey Barnes set him up perfectly to secure a crucial victory for Leicester. ​Leicester truly looked like themselves again, and bounced back in style after last week's ​devastating defeat to Watford. The Foxes dominated throughout the game and played some quality football, as they won back to back home league games for the first time this season. Althougn Fulham's equaliser shocked Leicester and put the visitors level for almost half an hour, the hosts kept pushing and eventually scored a deserved winner. Brendan Rodgers will be delighted with the result, as he won his first home game in charge to the delight of Foxes fans. Starting XI: Schmeichel (7); Chilwell (6), Evans (6), Maguire (6), Pereira (7); Ndidi (7), Tielemans (7); Barnes (7), Maddison (6), Gray (6); Vardy (9*). Substitutes: Ghezzal (6), Okazaki (6), Mendy (N/A). STAR MAN - It was a day to remember for ​Jamie Vardy, as he scored twice and assisted Leicester's first goal to take his goal tally for the club up to 100 goals. It was a brilliant performance made sweeter by his new record, as Vardy was back to his best on Saturday. Fulham had another away day to forget, as they continue their search for a first away win of the season. It was a depleted performance from the Cottagers, as new caretaker manager Scott Parker's tenure begins with bitter back-to-back defeats. Fulham were shambolic in defence, and were cut open far too often. Although their equaliser got them back into the game and got them a glimmer of hope to salvage something, overall it was another poor performance from Fulham as they edge closer to relegation. Starting XI: Rico (6); Bryan (6), Ream (5), Nordtveit (5), Odoi (6); McDonald (6), Chambers (6); Sessegnon (5), Cairney (6), Babel (6); Mitrovic (6). Substitutes: Ayite (7*), Seri (6), Vietto (N/A). STAR MAN - In a game of very little quality for Fulham, it was Floyd Ayite's goal that gave them the slightest chance of winning. The substitute scored just six minutes after coming off the bench at half time, though his goal wasn't enough for the Cottagers in a damaging defeat. With neither side still in the FA Cup with the quarter finals next week, they are both next in Premier League action. Leicester travel to ​Burnley next Saturday, before hosting ​Bournemouth on 30 March after the international break. Fulham have two huge games at Craven Cottage next, as they host both of the title contenders. They start by welcoming ​Liverpool to west London next Sunday, before ​Manchester City are the visitors on 30 March.